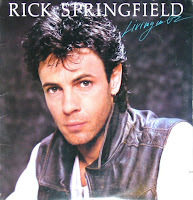 Rick Springfield is coming out with a memoir, with its title taken from the lyrics of "Jessie's Girl": "Late, Late at Night." Apparently the singer has battled depression for years, and his book will examine those struggles. Funny how, when all we know is the person's public facade--fame and money and talent--we can't imagine how anything at all could be wrong with their lives. "Richard Cory," anyone? There was a doll named Crumpet? Kate Gosselin as Carol Brady? This means they're healthy now, right? Right? Luxury kitchens: A generational thing? Classic Clip Monday: Let's go record shopping! 25 Best Gen X books ever?